Rotterdam was the fourth ship built for the Holland America Line to use this name and the largest built for a Dutch company at that time. Although Rotterdam matched in size the White Star and Hamburg Amerika ships in service at that time, the emergence of Cunard’s two 31,500-ton liners Lusitania and Mauretania in 1907 had began a new era in shipbuilding. Liners dramatically increased in size over the following years. Rotterdam set out on her maiden voyage from Rotterdam - New York June 13th 1908. That voyage saw her set new standards in transatlantic travel, as she was the first liner to be operated on that route with a glass-enclosed promenade deck. Many passengers classed Rotterdam as the finest liner in service at the time. After the outbreak of World War One in 1914, the Holland America Line continued to operate Rotterdam on the Atlantic run as Holland had declared a state of neutrality. They were forced to withdraw Rotterdam from service in 1916, as the North Atlantic had by then become a chaotic war zone. 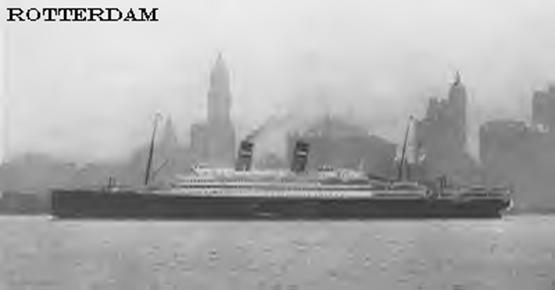 The end of the war in November 1918 allowed the Holland America Line to re-deploy their flagship on the Rotterdam - New York run in February 1919. Rotterdam continued uninterrupted on that run until she was returned to her builders for conversion to oil burning boilers in 1923. Two years later, a decline in the number of passengers crossing the Atlantic led to Rotterdam undergoing a second conversion, this time to make her more suitable for cruising. The Holland America Line then operated her between the Atlantic run in summer and as a cruise ship in winter. The outbreak of World War Two forced the Holland America Line to take Rotterdam out of service in December 1939. After 31 years in service, she was sold to a Dutch ship breakers in January 1940.